AMERICAN think-tank, Council on Foreign Relations (CFR), yesterday said the weekend explosion at a Zanu PF rally in Bulawayo was confirmation that Zimbabwe’s political landscape has not yet shed off its violence culture since independence in 1980. “As shocking as the development is, violence has been a constant feature of Zimbabwe’s political landscape and the prospect of violence has hung over these elections long before Saturday’s blast,” Michelle Gavin, a senior fellow for Africa Studies at the CFR said in a commentary. 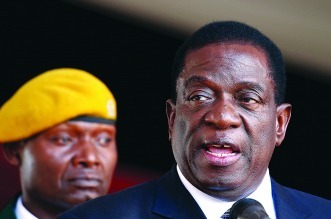 “Indeed, (President Emmerson) Mnangagwa won his presidential title last November through violence. Despite widespread domestic and international support for the military’s ouster of long-time President Robert Mugabe, it was force, not popular sentiment, that enabled Mnangagwa’s ascension and the “new dispensation” in Zimbabwe,” she added. The Council on Foreign Relations (CFR) founded in 1921 and specialising in US foreign policy and international affairs argued that political power in the country has often been assumed through violence and intimidation. Gavin served as the US envoy to Botswana from 2011 to 2014, and served concurrently as the United States representative to the Southern African Development Community (Sadc). “Of course, the politicisation of violence is a tragic part of the country’s DNA. From the horrific violence of Zimbabwe’s liberation struggle, to the horrors of the Gukurahundi massacres of the 1980s (in which Mnangagwa himself is implicated), to the beatings, torture and killing of political opponents of Mugabe’s regime in 2008 and beyond, political power has been sought and maintained through violence and intimidation. “Turning the page on this history would require a real reckoning with the past that, thus far, has proved unappealing to the powers that be,” Gavin added. Mnangagwa escaped unhurt after the explosion that has claimed two lives, and left 47 others injured including his deputy Kembo Mohadi. Police maintain no arrests have been made, but Southern Eye has it on good authority that several youths from Bulawayo have been picked-up and released after questioning. Zimbabwe has a questionable human rights record emanating from violent episodes that have gripped the country, dating back from independence in 1980. Thousands have been killed, injured and displaced in the violent episodes, with Gukurahundi being cited as one of the worst owing to the scale of magnitude of deaths, with reports saying over 20 000 people were left dead.